How did a remnant of scattered Jews rise to build a mighty superpower in the Middle East? Fleeing his father’s anti-Semitic organization, Charles Devonshire journeys into the most volatile landgrab in history—Post WWII Palestine. Charles pursues a beautiful but mysterious librarian, Gladia, who introduces him to the elaborate Jewish underground. While joining their plight to reestablish a homeland, he falls in love with her and faces painful challenges in developing a relationship within their culture gap. And in the midst of battling the hostile inhabitants who also laid claim to Palestine, he searches for clues of his own troubled past. Can Charles pursue love, uncover his family secrets and avoid being trapped in the middle of the world’s longest feud? Rebirth draws you into 1948, into a world of intrigue, espionage and anti-Semitism. Witness how ancient prophecies were fulfilled against impossible odds as Israel built a nation and defied skeptics. Journey through the precarious events that led to Israel’s miraculous rebirth on May 14, 1948. Experience the unrelenting pursuits of the most persecuted race, and how their renewed strength reestablished their original language, customs and land cultivations after 2,000 years of desolation—an accomplishment no other nation can claim. 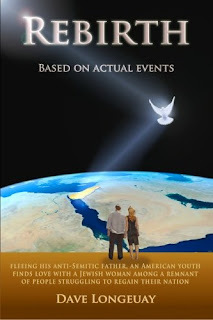 Watch Rebirth's exciting 90 second book trailer at: http://www.youtube.com/watch?v=0aaCj8zwe... Dave Longeuay is a multimedia producer and has been an avid student of prophecy and Israeli biblical history for over two decades. The Goodreads summary above is extremely comprehensive and offers the reader just the right amount of information as an introduction to this novel. Charles fled his father's anti-Semitic organization and found himself in post-WWII Palestine. He meets Gladia fairly early in the novel. Gladia is portrayed as beautiful, intelligent, and witty. Charles takes an instant liking-and attraction-to her. Charles is an interesting character. He is somewhat lost in this new environment, but he still soldiers on. His questions lead to informative answers for both himself and the reader. The author describes post-WWII Palestine vividly. He doesn't leave out many details, if any. The plot, environment, tensions, undercurrents, etc...are all made known. The reader will be able to feel the suspense, fear, and perseverance of the characters. The determination of the Israeli people is admirable and appears a tad effortless-they don't give up easily. Their combined strength as a people is impressive. This book is an intense read, the reader will have a hard time putting Rebirth down. The book is well-written and contains smooth transition, recommended to adult readers.